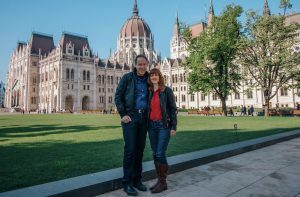 This photo of us was taken here in Budapest, standing in front the Hungarian Parliament Building. 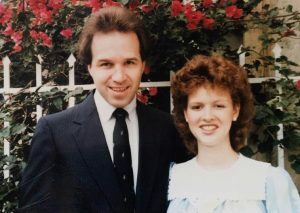 It amazes us that we are now in our 22nd year here in Budapest, reaching Eastern Europe with the Gospel. In the past few weeks we have been to Poland, Slovakia, Serbia and Bulgaria. And in the coming days I will be in Macedonia and Kosovo. I imagine most people could barely find these countries on a map. But to us these countries are as familiar as traveling to Florida and Georgia or Colorado, Texas or Nevada or California. Whether we are ministering to Gypsies in Slovakia or Bulgarians in the capital city of Sofia, all we see is people that God has called us to reach. And because YOU are helping US, YOU are also reaching them. Sometimes I wish you would have been with me last week when I was meeting with two pastors in Bulgaria and they shared with me their plans for a new church in the section of the city with no church in it. We are helping them start this church. Then in a year or so I will be amazed to meet with them again and they will share with me so many stories. So as we end this year we would ask you to prayerfully consider giving a Special Christmas Offering before the end of the year. We need to raise an extra $7,000 before the end of the year. Prayerfully consider whether you can you help us with a Special Christmas Offering before the end of the year?.